Nurseries and pre-schools have a responsibility to protect children from the risk of burning when outside in the sun and have effective sun safety policies in place. Cancer Research UK report that “skin cancer is one of the most common causes of cancers in the UK and the number of cases is rising at an alarming rate”. Some types of skin cancer are caused by UV radiation from the sun which is preventable. It is that time of year when we start to experience stronger rays from the sun and an increase in temperatures. One of the benefits of sunlight is the intake of Vitamin D and being able to enjoy and learn about the outside environment, however, there are dangers to being exposed to the sun without the required protection. Children don’t understand the risk or understand about needing to wear sunscreen when outside in the sun so it is essential that carers who are responsible for looking after them must ensure that they are protected from the harmful effects of the sun. Children who are not protected and are exposed to the strong UV rays of the sun may not be affected now but could be in the future as skin cancer can take years to develop. Children are more susceptible to being burnt than an adult as their skin is much more delicate. 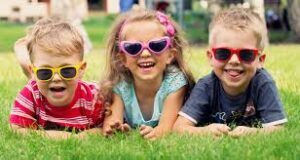 Businesses within the childcare sector have a duty of care to the children they are responsible for, in order to protect them you should implement a sun safety policy detailing how you are going to protect the children’s welfare. You also have a duty of care to your employees. When any children and employees have time outside ensure that they have been given sunscreen to wear and this should be applied 15 minutes before going outside. Always check and record when sunscreen is opened and don’t exceed the expiry date. Any policies should be written with support from other employees and also get the parents consent. Ensure that you have a Risk Assessment for outdoor activities that covers sun exposure, this Risk Assessment must be communicated clearly with your employees and they must also sign the document to say that they have read and understood. Assess the area where you intend to be outside and if possible there should be a shaded area for use during the peak times of the day when the sun is at its hottest. There should be access to plenty of drinking water, and children should be encouraged to drink every 20 minutes when outside in hot temperatures. To conclude, some types of skin cancer are preventable with the correct control measures in place. Organisations in the childcare sector must take responsibility to address the potential hazards of the summer weather and put effective procedures in place to protect children and workers alike. Contact our expert Health and Safety team today for advice and guidance putting effective sun safety policies in place.